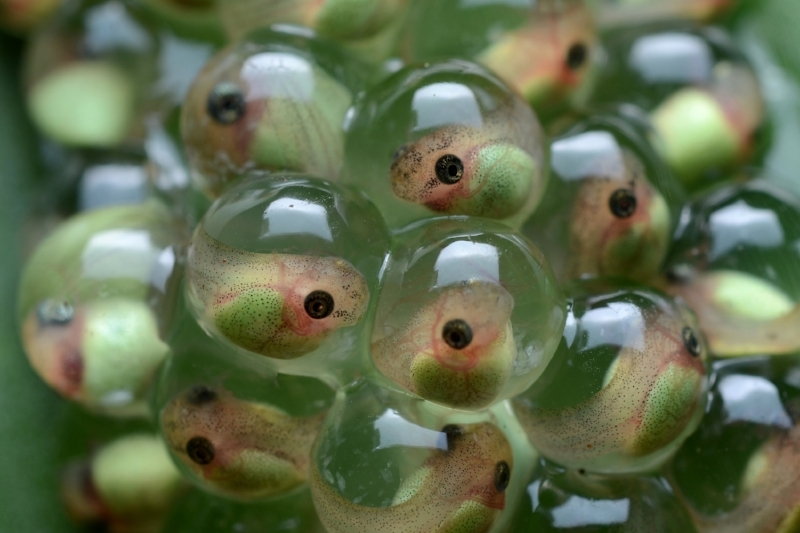 Put your mind in the mind of a tadpole, your watery pond corner your whole world, where all the nutrients you need exist. You hatched out of your little jelly egg into a whole different reality—a little scarier and waterier than you were used to, and swimming is now a thing! And eating! The world has turned on its head! V'nafoch hu. But, in time, that underwater world becomes normal. After some time eating decomposing lilypad leaves and growing, something earth shattering happens: these nubs start popping out of your flesh and turn into legs. Certain gourmands might be shouting for joy, but you, the tadpole, are freaking out! Not only that, your tail, which you've relied on all your life, starts to shrink! Is this the end? V'nafoch hu! Then, one day, you discover lilypads aren't just for eating. Using your newfound legs, you climb on top of the lilypad for the first time. These apendages you thought were the end of your life are only a beginning. Look at all the beautiful plants above water! And there's air—which, by the way, you're now breathing—and succulent flies. And this tongue you have to catch them! And jumping! V'nafoch hu! At this point, I'll say that Purim is not my favorite Jewish festival. But Pirkei Avot (which I like to call the "Ancestral Wisdom collection") tells us to "turn it, turn it, for everything is in it"—"it" meaning Torah, which for me includes the category, holidays, disliked or otherwise. I could go into a whole shpiel about the Importance of Not Tossing Away the Uncomfortable and Inconvenient, but it's Purim, so I'm going to keep writing about ... frogs. V'nafoch hu. We could imagine that, given a long enough lifespan and a complex enough brain, you, now a full-fledged frog who would gradually get very used to even that new world, would discover further intricacies of your pond ecosystem, then how that plays into the surrounding fields, and then correspondingly into the local watershed, larger geographical area, etcetera, until you were conscious of the way our galaxy interplays with the broader universe, and further. V'nafoch hu. Upheaval. It's a phrase we read in Megilat Esther/the Esther scroll today for Purim. Just when you think things are about to end (and really really badly, in the case of the Shushan Jews), up becomes down and down becomes up. Though he didn't talk about frogs, this froggy tale is the way Rebbe Nachman of Breslov thought about the silliness and revelry of Purim that I so dislike: it's precisely the upside-downness of the shtuyot/follies of Purim which allow us to achieve breakthroughs in our awareness, like our beloved frog. Let me explain. When we have integrated what we know—our Torah, in the loosest but most profound sense—we may think we're hot stuff, on top of our game. But what's happened is that we've plateaued. In order to continue growing, something discontinous happens within us, often unconsciously. Have you ever woken up and all of a sudden the world—in whatever large or small scope—doesn't make sense the way it used to? Like the tadpole budding legs, something has happened in your consciousness, and it might be terrifying because you haven't yet made the climb to the lilypad. V'nafoch hu. Your world has been turned upside down. Rebbe Nachman says that the tzaddik, someone with great spiritual attunement and mastery, intentionally engages themself in shtuyot on Purim. Quoting a passage from Talmud (Menachot 99b, which bases itself on this week's parsha, for those who want to geek out at home), he explains that this is "[because sometimes it's necessary to] cancel Torah in order that it may stand." Get it? You need to cancel Torah (all you thought you knew) in order to make Torah (the next iteration of your conscious awareness) come to pass. This speaks to the most up-to-date studies of the evolution of consciousness, which is iterative and continuous if we let it be so for us. This Purim, I vote for deliberately jumping into the state of V'nafoch hu, and deliberately engaging in shtuyot. For me, it'll sure be uncomfortable. Awkward, even. But our kavannah/intention should be toward letting go of what we think we know—swimming into the scary, watery pond—in the hope that this will bring about truer Torah: embracing awareness of our mutual connectedness and interdependency. Keyn yihi ratzon. I bless all of us that it may be so. Purim sameach!